ECommerce aside, developing any business related website is an intense project. You’re juggling other work, pulling teeth for copy, and trying to satisfy your entire company while that existing website looks worse and worse. Our objective as web designers and developers is to create a digital presence that’s smart, authentic, looks good, and appreciates the needs of the customer and internal team. No simple task. When you add eCommerce to the mix, things get more complex. There are more stakeholders, the pool of customers is larger, there is more functionality to build, and results are immediately quantified. For businesses that use their website as a direct sales channel, subtle shifts can make a remarkable impact. Following an intentional process to define those details is important. That being said, it’s just as easy to laden the process with too many steps and second-guess every move as it is to miss the mark by skipping an opportunity for good insight. 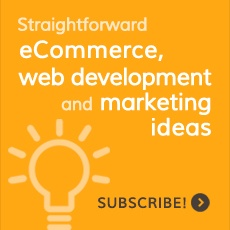 So, what’s a business that’s eager to revamp its eCommerce channel to do? For us, it boils down to five steps. We tend to shy away from marketing agency talk, those guys like to call this “discovery.” Truth be told, we toss that term around too. Call it whatever you like though, because it is what it is and you have to do it. If you’re working with an external partner, they will bring a new fresh perspective, but will need to get up to speed on the basics. If you’re leading an internal team, it’s helpful to step back and refocus on what matters. How has this business changed? What sets this business apart? What are goals and the timeframe to get there? What’s worked and what hasn’t? Once that foundation is set, move to the details. Define each step in the sales funnel for both offline and online sales starting with lead generation all the way to shipping. How does eCommerce integrate into the larger sales process? How do sales reps fit in, are they using the website as part of their sales process? How important is the online channel? When we’re working with a start-up or smaller business, we concentrate on input from the team, digging into the existing website and sales data, reviewing marketing plans (simple ones are great!) and researching competitors. In an ideal world though, we go a bit deeper with surveys and customer interviews to gather more intel. Now it’s time to get technical. Has your business implemented a formal enterprise resource planning (ERP) system? If so, adding your new website into the fold may be pretty straightforward. If not, begin by identifying all of the legacy systems used in sales, accounting, inventory management, fulfillment and tracking. It’s critical to integrate your website into this existing system, and to ensure that you’re integrating your website into the right system. If your business is stepping into eCommerce for the first time or still getting serious about it, there may be some holes or redundancies in the process that should be identified and addressed. On the other hand, if the eCommerce channel is well-established, some of legacy systems may be out of date. Is there software that may soon be replaced? What is the sales system for physical stores and showrooms, phone orders and printed catalog sales? As you work with your web team on a new eCommerce site, it’s easy to focus on sales growth. Don’t forget there is also revenue to be gained by building efficiencies. As we develop a new eCommerce site, we’re looking for hooks to connect the dots – API, EDI, or file transfer. What is the interface to automate? We don’t want to have to re-enter things. It’s a waste of resources, opens up the door for errors, and it’s not scalable. A substantial amount of time is dedicated to keeping the website up to date, even on an eCommerce website with a relatively low number of SKUs. To optimize this process, it’s important to document how inventory changes over time. For businesses that manufacture and sell their own goods, these changes may be managed by several internal teams to ensure that prices, descriptions, images, and shipping details are accurate. For businesses that sell outside brands, data may come from multiple sources. The final step is selecting the right eCommerce platform [should eventually link to the post below]. This is an important decision for established online sellers and first-timers alike. In fact, we caution our clients that are rebuilding a website against defaulting to the existing platform without considering alternatives. This is true regardless of whether they currently have a custom or an off-the-shelf solution. The landscape for eCommerce platforms has rapidly evolved, so the tool that met the needs of a business three years ago, may not be the ideal tool today. The design process often happens in parallel to the investigation we’ve been discussing. As long as you are armed with the business vision, current site analytics, and a solid understanding of the consumer and sales approach — you’re ready to define a new online user-experience. The first wave of deliverables you use to map that out and establish buy-in may include site maps, wireframes, flow diagrams, visual design boards, and top-level content plans. Once the site structure has been established, you can transition into the more traditional aspects of design by considering color, imagery and iconography. The final step is developing the site, testing it and pushing it live. During the initial build out, be sure to develop use cases and test on all browsers. This should include accounting, fulfillment set ups and inventory level adjustments–real world testing on a server that isn’t accessible to the public. Then, just when you thought that was enough testing, don’s stop. Get your site live, get some data, then test some more. You’ll discover some surprising things. Maybe there was too much copy on those product pages after all. Or moving a picture here or there makes a difference. The process of reviewing analytics, testing alternatives and refining is where the money’s at.